Hello blog hoppers! 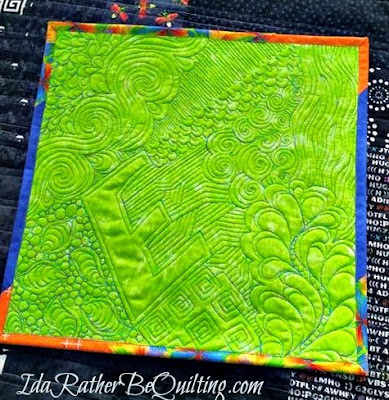 Welcome to IdaRatherBeQuilting. Thanks for stopping by on your cruise around the quilting blogasphere! This is my Freedom Star quilt, one of the quilts I made while living in Turkey. They make me both crazy happy and just plain crazy. And it is true that just when they start to get really interesting, they leave home. I had a bit of a rocky start in quilting, which you can read about on my About Me Page, but began quilting in earnest just before we moved to Turkey. I even packed a giant batting roll in our household goods shipment. I started a blog about that time to keep friends and family up to date on our travels and adventures overseas. It was called MyOrdinaryMagic.blogspot.com after my favorite book, The Magic of Ordinary Days by Ann Howard Creel. I posted quite a few finished quilts amongst the travel/adventure posts and began to participate in the online quilting community. When we returned to the states and I became involved in the local modern quilt guild, I decided that it was time for my quilting to have its own online home. Thus began IdaRatherBeQuilting. 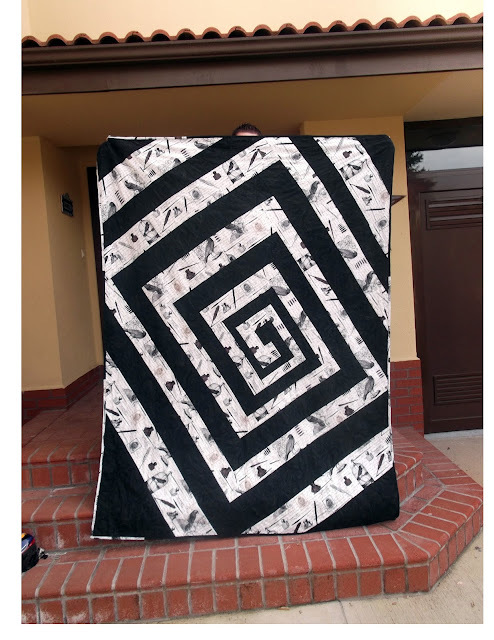 I imported all the quilt posts from the other blog and have been blogging here since! Twin House Quilts for my parents (red) and a sister (purple) who moved in the same year. Eleplay - a mini for a swap, two things I've recently discovered a love for. I've never had any of my quilts long armed or quilted by anyone else. Mostly out of frugality but also because I love modern quilting's emphasis on creating a quilt yourself, start to finish. So improving my free motion skills has always been a goal and a practice. Recently I've been creating practice square mini quilts to be given to older siblings when I make a baby quilt (I do a fair number of those). You can check those out in my FMQ Practice Minis Gallery. My best blogging tip is to make sure your sister marries a nice patient man who is well versed in html code and accepts cookies as payment (real cookies, not the digital kind.) But if that doesn't work out for you - read and google and ask and learn all you can about the technical side of blogging. It can be scary but also immensely satisfying to expand your digital know-how. Also to let your personality shine through your posts. As quilters we want information but we also want to connect with real people. 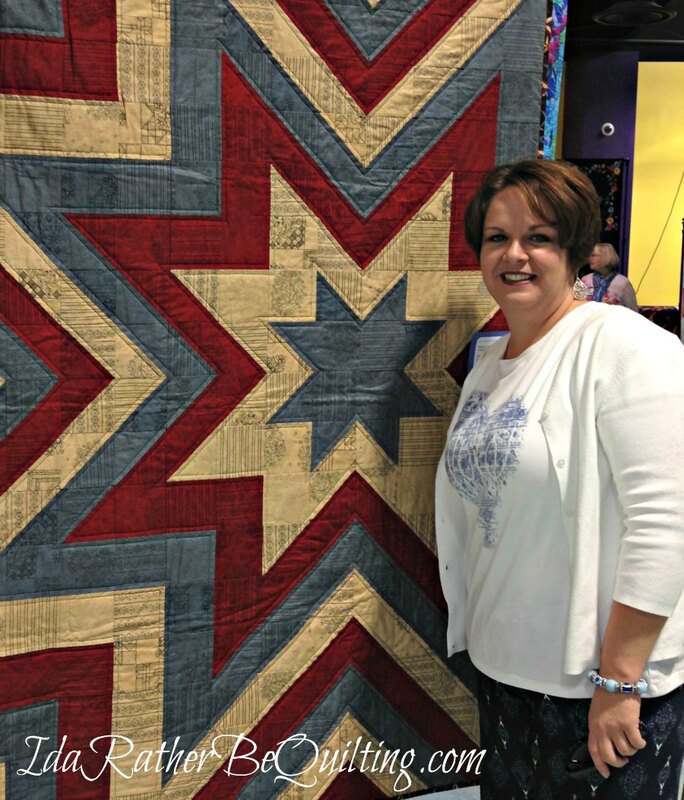 My quilting tip is along the same lines - join a guild! Meet real people to learn from and to share with and to inspire. The online community is wonderful. I wouldn't be a quilter without it. But we all need real time connection and guilds are a great place for that to happen. If you are interested in improving your FMQ skills - buy Angela Walter's books, use only good quality thread (I like polyester threads from Superior or Aurifil) and practice. I promise - you will get that muscle memory going and it will get easier. And prettier. -As a child I lived in Iran for 3 years. -I once visited a chocolate factory in Switzerland and spent quite a long time in their tasting room. -I watch MASH reruns while I quilt. They are the soundtrack of my childhood and I don't need to look up to know exactly what is on the screen. Visit all the hosts for a giveaway and links to the other hive bloggers for the week. Thanks for visiting my blog today, I hope you come back! My husband's name is Geoff and I have the same problem! It's way too common even if he spells it funky. Unusual names do have their perks! Although once in Kohls a lady in front of me felt so bad for my old fashioned name (hers was Ann) that she gave me her coupons. I guess that ended up being a perk too! When I was in my 20s I had a friend named Ida! Since that was about when you were born, there is another one within 20 years of you!! My name is very common, as is my husband's, but my daughters all have very unique names, and they love it! One is like your husband, with a weird spelling, which is good because recently her name has become popular. I always wished I had a more unusual name! 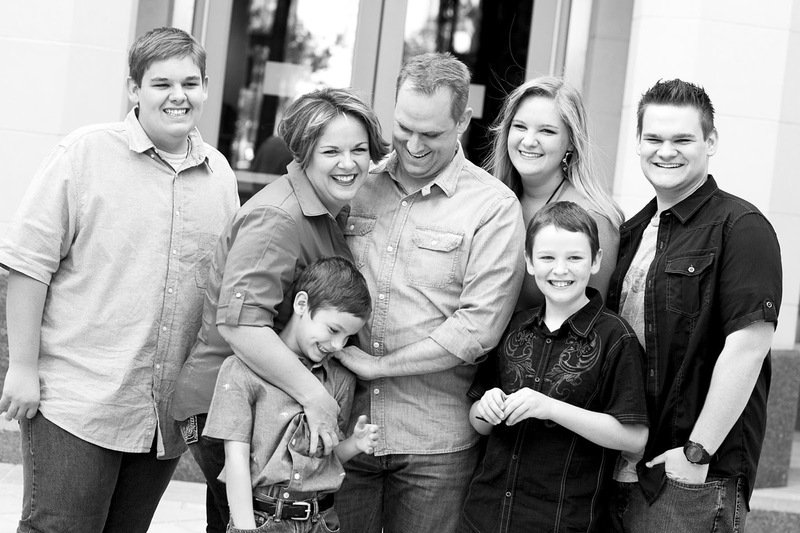 As the mother of a soldier, I thank you and your family for their service to our country, directly and as support. I meant to tell you how much I enjoy seeing your quilt...as a longarm quilter, I'm super interested in the quilting other quilters are doing. You do a fabulous job with your quilting and I'm amazed that you do it with a DSM!! A skill I don't have, but, like you, I have all of Angela's books and they live on my LA's table because I am always looking through them for inspiration!!! Hi Ida . Having followed your blog for oh all of three weeks now , it's nice to know more about you . Your fmq is fantastic , I haven'tivrf much beyond quilting flowers or straight lines . I have so much to learn . I could use a cookie eating html coder. I love doing FMQing on my domestic machine and yours looks fantastic. Oh I love the elephant! Gorgeous! There aren't too many Eleanors here either. Having travelled a fair bit in Europe, I've found that most areas have a local version, which I like! It's horribly misspelt often though. Nice to read more about you Ida. My grandmothers were Winifred and Millicent, kinda glad I ended up with Allison! Interesting you and Hannah at Modern Magnolia Studio have come up with the same tip: get involved with local quilt groups. Your fmq is inspiring! 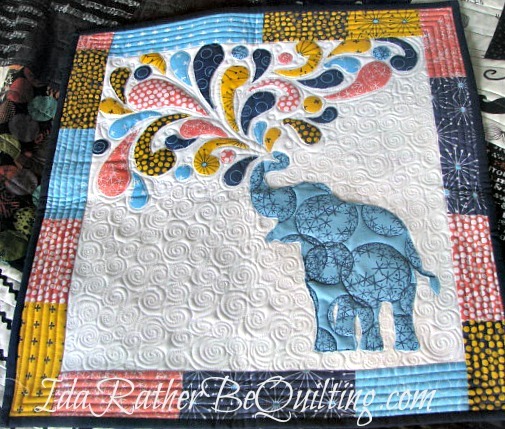 Beautiful quilts - i love the imagination and happiness exuding from your elephant mini! One of the mistakes I made was waiting so long to join a guild. I had a little quilting circle going in Boston, but I was the youngest by about ten years, and the only one without children, so it was mostly me listening to everyone give each other family therapy while we sewed. You guys are crazy fun! I'm lucky that I ran in to Christa and she convinced me to join up with you. I love your quilting! I can't do the domestic thing, so it's always astounding when other people are so good at it! Angela's books are wonderful, and definitely take a class with her if you have the opportunity! You know, I'm not very good at this thinking of things to put unnecessary exclamation points on, so I guess I'll stop that now. Is Geoff really an unusual spelling? Maybe I don't find it so because one of our family friends is Geoff. Until I was seventeen I thought that was how everyone spelled it. I think you and Yvonne did well on the names. I hate having such a common name, although fortunately it means that I'm really difficult to Google search. My 26 year old daughter's middle name is Ida. She's named after my husbands grandmother. I've noticed a lot of the older names are coming back in style like Olive for example. You are an amazing free motion quilter. I'm still quite a novice but I do love it when I get around to it. I try to quilt most of my own quilts also. Hi Ida, so nice to meet you. I remember that elephant mini, I think I saw it on a WIP post - it's amazing! I'm equally impressed with your quilting skills - wonderful. can't imagine having time to quilt with five kids, four of them boys, so again, impressed. I agree I need to be more active in guilds...i'll try to take your advice in the fall when my only leaves for college. I'll have more time then. Glad to have found your blog. I love your name! Ida isn't common at all! My Grandma's name was Opal and part of the inspiration for the name of my blog as well! I love each and every one of your quilts! Kudo's to you for all that FMQ! Great to get to know a bit about you, Ida! 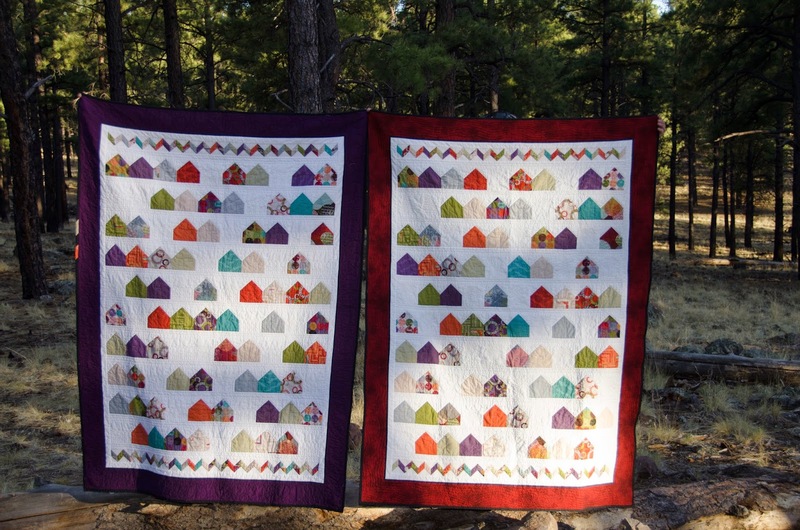 I love the house quilts you made for your sis and parents, such great gifts! You're lucky to have such a unique name, when I was a kid there were 3 Elizabeth's in my class with last initials B, C and D...taking attendance was always a gong show! Ida, it was so fun reading about you. Love your writing style! Your quilts are amazing and your FMQ is -well- amazing too. Thanks for sharing a little about you! Nice to meet you. My grandmother's name was Ida. I love Poe Spiral. What a great pattern. Hi Ida, I remember leaving a comment previously about your wonderful Eleplay mini! Your fmq is beautiful and I really need to practise more! I joined my Guild just after I made my first quilt last year. The inspiration, encouragement and friendships I have made through this group has been invaluable. Great tip! Hello and nice to meet you! Your quilts are just gorgeous! Whereabouts in Turkey did you live? I spend my working week Skyping with colleagues in Turkey and they are fab people, it makes me think of Turkey as a friendly country! Great post, love love the family pic and what you said about all girls, lol. Your quilts are beautiful; that Poe one especially is so unusual and intriguing to look at, which I did, for a while...going to check out the link, what's one more on the "to-do" list? Oh yay for Angela. Love that gal. And yep, so many people don't think it will be "good enough" if they quilt it themselves, but it IS always good enough. I, too, have never sent a quilt out to be quilted. Your elephant quilt too...wow, is that an original design? You should read The Elephant Whisperer, such an incredible inspiring story. Ok, I want that mini Eleplay! LOl... I love elephants and your mini is so cute! The free-motion quilting is awesome too. Thanks for sharing you love of quilting and family with us.